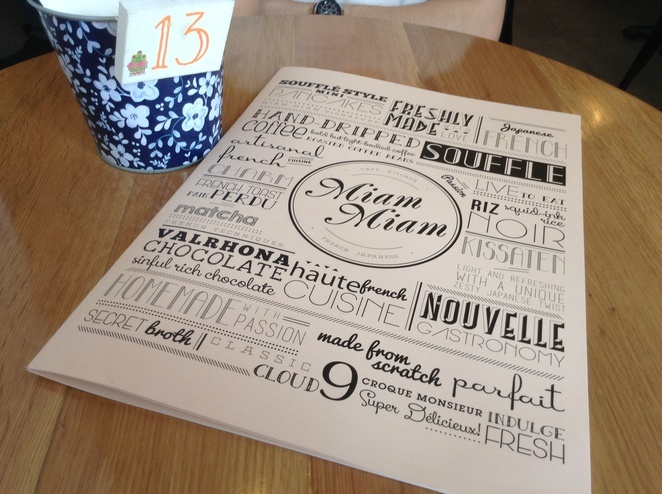 A table for two at Miam Miam. I stumbled across Miam Miam during my regular weekly visit to 1 Utama, startled to find a long queue outside this brand new cafe. I had been aware that the lot was under construction for a while, and it was a pleasant surprise to see the end-product: a warm and cosy cafe, elegant in its simple front decor. 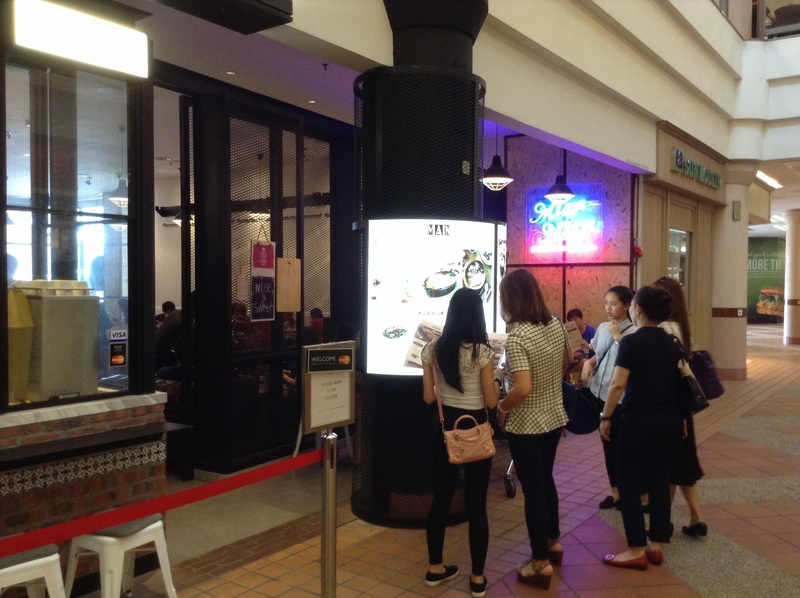 Granted, the large menu wrapped around a pillar in the front of the store is a bit of an eye-catcher, and I knew that I had to try it out one day. Diners checking out the menu. Nick and I finally got the chance to drop by a week ago, and we were lucky to get a table for two. 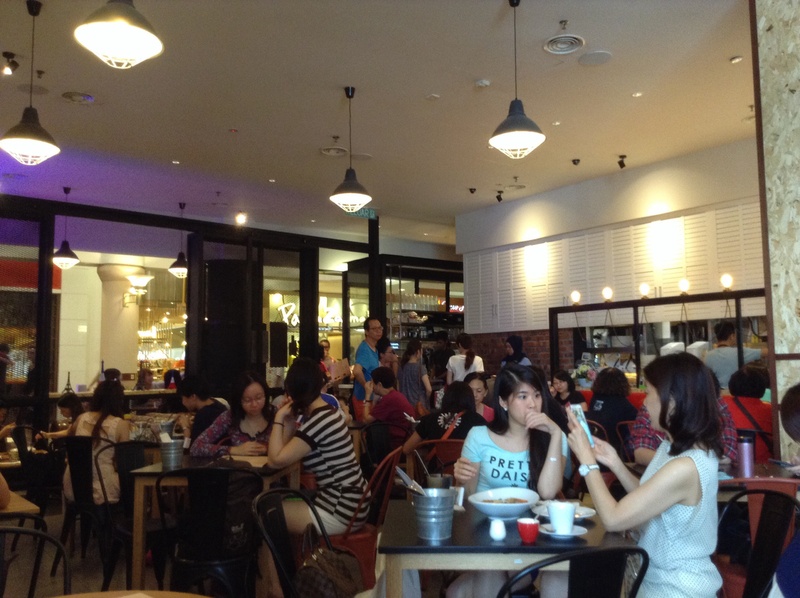 The cafe was packed with diners; groups of friends, couples, even a family with grandparents in one corner. We got a seat in the back of the cafe just beside the door leading out to their el fresco dining area, which neighbours the mall's ground floor carpark. There was nobody out there on this day though - it was way too warm. 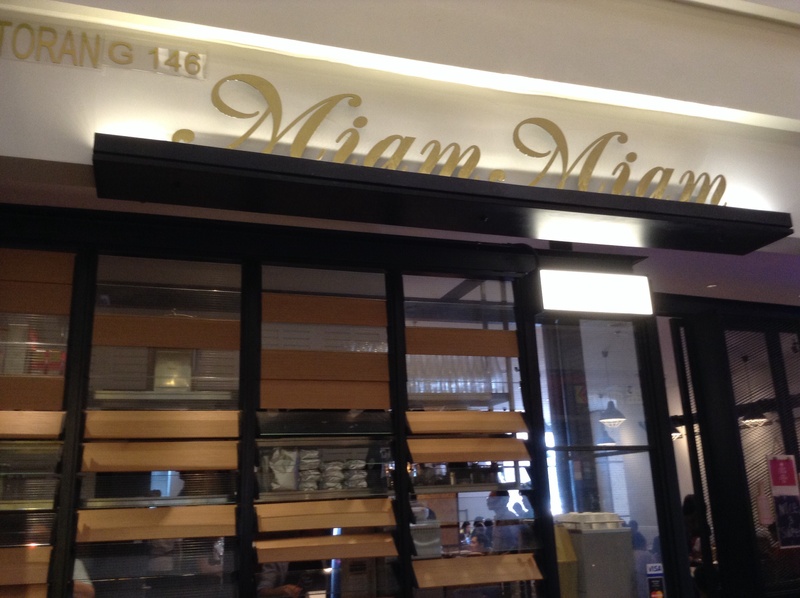 Miam Miam prides itself on its hybrid nature - originally from Singapore, the cafe is inspired by old-school Japanese 'kissatens' and the flair of French artisanal cooking. Their first foray into Malaysia popped up in Penang, and the 1 Utama branch is their first in the Klang Valley. Unlike the original cafes, this one is pork-free, with all ham and bacon replaced with turkey and beef. Their drinks menu is dominated by teas and coffees. Nick decided to go with their tea with softee, which speaks for itself. The tea is milky and smooth, but I personally felt that it needed more sugar. 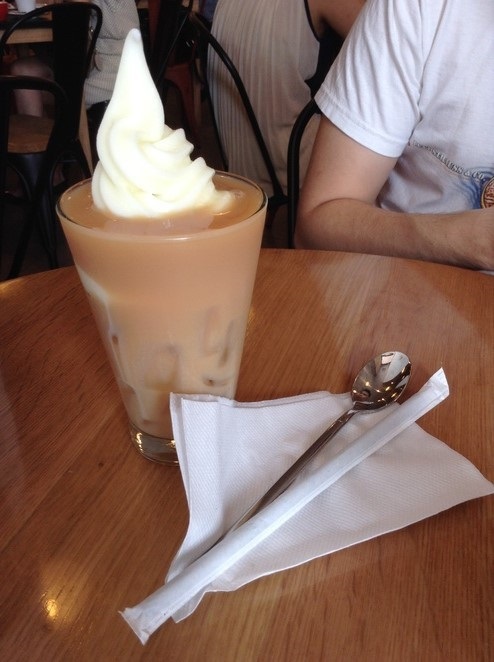 The softee was lovely, and they were quite generous with the amount they swirled into the beverage. We decided to go with some of the crowd favourites, based on some quick online research by Nick. 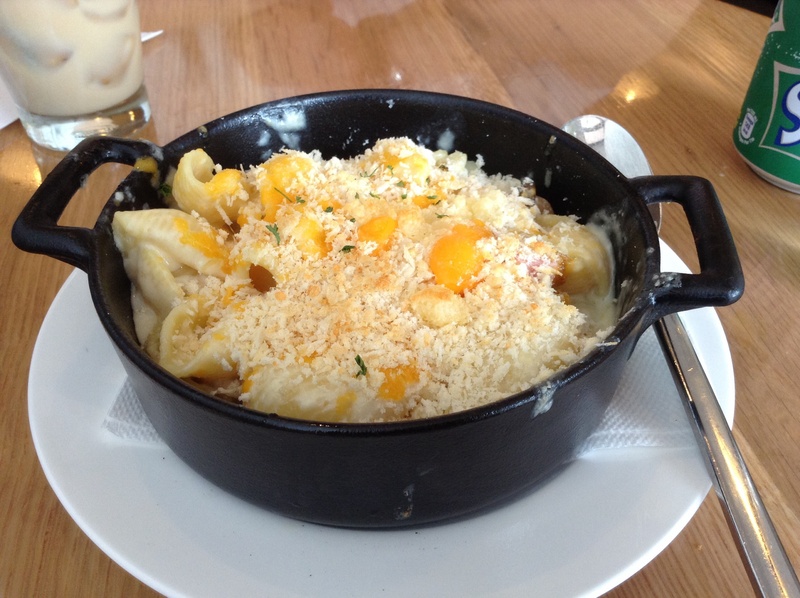 I really like the food presentation here - the mac and cheese arrived in a quaint black pot, covered in thick cheese and crispy breadcrumbs. This was a very chunky dish, with fat pasta shells and ooey gooey cheese. Delicious! I would recommend that this be shared, because I don't think you can finish it all on your own. The cheese makes it very filling. Our second dish was the Miam Miam spaghetti, which is one of their signature dishes. There are quite a few ingredients thrown into this meal: turkey ham, beef luncheon meat, mushrooms, sesame seeds, baby spinach, tomatoes - all topped with a wobbling soft poached egg. We were instructed to mix it all together, and the result was a silky smooth pasta carrying a subtle taste of shoyu and enhanced by the textures and flavours of the meat and vegetables. It's a lovely contrast to the thick mouthfuls of the mac and cheese, very light and savoury. There was a lot of this, and definitely more than enough to share. I even saw a table nearby with three girls sharing this one dish between them. In the end though, the high note of our dining experience was the french toast. Yet another crowd favourite, we were told that we would have to wait 45 minutes for this to reach our table. I was a little shocked at the waiting time, but we figured since we also had another two dishes to go through before dessert, we could wait for a while. Thankfully, it only took them 20 minutes to whip this up for us. 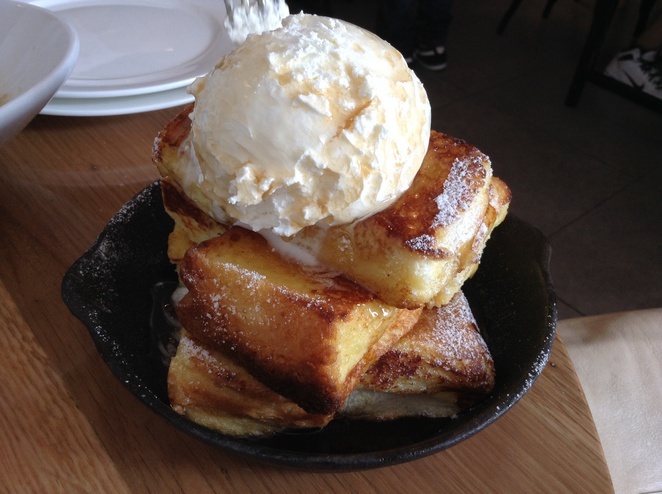 The toast is thick and baked a golden brown, topped with a generous scoop of whipped cream. A tiny cup of maple syrup accompanied the dish, and part of the experience is watching the liquid spread over the bread and cream, dripping gently to the bottom of the plate. It tastes wonderful. The texture of that thick, fluffy toast, crisp at the edges and with that delicate maple syrup sweetness sent fireworks shooting up my brain. I would definitely come back here again for this. There are also a bunch of other lovely things on the menu, such as souffles, baked rice and squid ink pasta. The souffles in particular look divine. We had a great time here, though the bill came up to a hefty RM97, which I found really expensive. Even my soft drink came at RM5 for a can. I'm glad that the taste exceeded my expectations! The ambience is nice as well, with cheerful French instrumental music in the background. For its image of a French-Japanese cafe, I felt that the menu looked a little more Italian though, with all the pastas, and french toast is not necessarily French ... but nevertheless, a very unique concept. 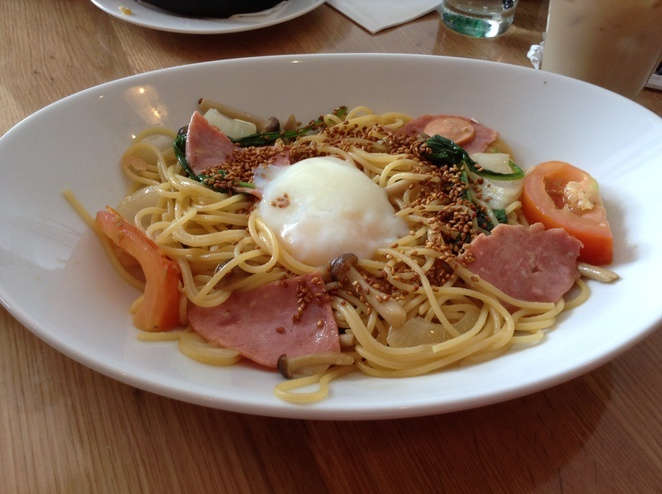 The spaghetti look delicious; it is different from the usual spaghetti dishes on offer.